I've shared a few of my Christmas shelves around the house already and even a few glimpses of the mantel. 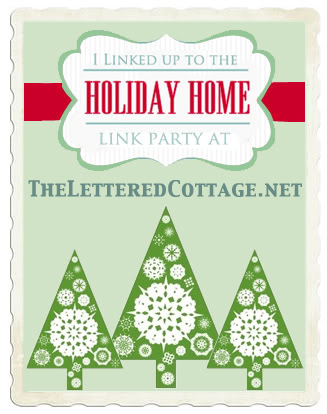 I decided to put them all together here for Layla's link party on Tuesday December 4 at The Lettered Cottage. The feathers and boa help at a little bit of snowy ambiance. Check out the tutorial here for the garland cone trees. The garland is made from felt, poms, and silver thread. Check out this tutorial here. We went with an aqua and silver theme for Christmas this year largely due to the new painted hutch. We just recently finished the bathroom redo and striped the ceiling so it was really fun to add some Christmas cheer to this space too. A wicker charge helps to provide some warmth and texture with this icy pallette. Thanks for stopping by! I will be back on Wednesday with another cute and simple Christmas craft.